Gross misconduct and utterly incompetent. The "doctor"'s actions were unfathomable and he shouldn't be practicing medicine. The staff are rude and act as though doing their job is an inconvenience and you are a bother. DO NOT LET YOUR LOVED ONE COME HERE!!!! The staff at Canterbury on the Lake is very helpful. It's a very nice community with lots of things to do. Their rooms were of very good size. The menu is like going to a restaurant. One of the things that we liked most about Canterbury was that the apartments had a washer and dryer included. The staff was very nice, and we loved the grounds' flowers and shrubs. They had a screened-in porch, too. I would definitely recommend it. The only issue with it was that they had the longest waiting period, and I can understand why as it’s a very nice place. My mom was at Canterbury-on-the-Lake. The rooms were beautiful, and the staff was very friendly. She really enjoyed her stay there. The rooms were very spacious and clean. It had a luxurious feel to it. Their dining room was very homey, and the food was very good. We've gone to Canterbury on the Lake. In fact, a friend of ours has moved there, and she is very pleased with the place. What they do is give you a meal allowance. and meals are available for lunch and dinner. They also have a little café where you can get snacks and sandwiches -- things like that -- during the day. Terrible place. My mom was there for 8 months and hospitalized 9 times. Thank goodness I was there to check on her. I had to demand she go to the hospital every time and once she was taken she was in hospital a week to ten days EVERY TIME. They don't care. Don't judge it by looking at the outside. Watch and protect your loved one. My parents were both residents of Canterbury. They were there on different occasions. Each time the lack of answering call lights in a timely manner was a a real issue. It was not uncommon for them to have to wait more than 20 minutes for their call lights to be answered. The staff was overworked having too high of a patient load leading to unsatisfactory attitudes and care by most of the nurses and some of the aides. All of their nurses were LPN's. It is important to visit this faciility on the weekends when care is not adequate. There are people working on the weekends who really do not care about the patents. My mother fell while being left unattended by an aide in the bathroom and ended up dying. The nurse said it was the second fall on her shift. Prior to that my mother's teeth, glasses and laundry disappeared. The nursing staff told me it is not uncommon for personal belongings like that to disappear. Some of the aides and most of the therapists were dedicated and caring. Unfortunately the uncaring employees far outweighed the ones who were committed. I wish I would have listened to my instincts and found a different place. Without a doubt you have to be there as often as you can to be your loved one's advocate. My advice is to look elsewhere. There are better places out there. We've been to Canterbury on the Lake. It had 3 phases to it: senior living, assisted living, and nursing, so you won't have to be moved if you get really ill. I've been there for my mother-in-law. My husband and I stopped by on a Sunday, and they didn't have anybody to take us through. I think the man who took us through acted like he didn't enjoy taking us through the facility. He wasn't enthusiastic, but he was polite enough, but it didn't seem like he was really into it. My sister's-in-law's grandmother stayed there till she died, so I know that it was a good facility. It was clean. They had a lot of murals painted on the walls, and to me, if I was old, that would be confusing, but they might help seniors identify where they are. It seemed bright enough. They had a chapel that was very bright and nice. My mother-in-law is at Canterbury-On-the-Lake. The facility is clean and they had a lot of activities. They had a beauty shop there and a gift store. They have a lot of senior activities that they could sign up for and go for the day. The staff are very nice too. My aunt has just moved into Canterbury-on-the-Lake. She has only been there for about two weeks, but she has made friends already. She likes this place. She is excited because they have lots of activities, like parties, touch ball, a little putting competition, etc. She goes exercise everyday and goes down for meals everyday. I went to visit her there the other day and she's so happy with this place. The grounds are so pretty. They're well kept. It is a large place. 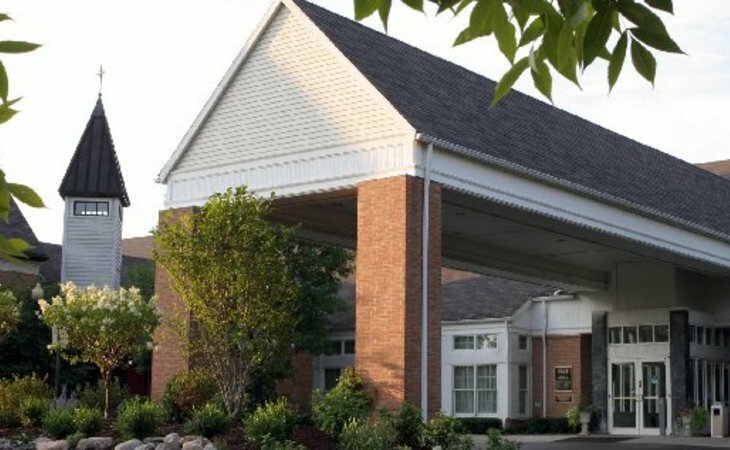 They have independent living, assisted living, skilled nursing care and a rehab area. However, because the place is big, it's so hard to find your way there. We had a very nice experience when we visited Canterbury-on-the-Lake for my parents. I liked the area surrounding this community. It was very open. When we were there, there weren't any activities going on at that time. However, they were setting up for the night. They were doing a casino night. They explained to us that residents would earn chips by participating in stuff and doing different things. It was really interesting. This community has independent and assisted living facilities. Both facilities were very nice, although getting from one area to another was a little confusing. Overall, the Canterbury-on-the-Lake is a very nice place for my parents. My friend had a hip replacement she stayed at Canterbury on the Lake. I visited her there several times. The staff seemed professional and very friendly. It was quite an excellent facility. It was completely clean. My Great Aunt moved into Canterbury On The Lake about three years ago. She moved there from another facility when they had an opening available for her. Canterbury has been great so far. They always have different activities going on, the staff members I've met have all been really friendly and attentive, and they all know her by name, which means a lot to me. The facility always looks very clean and inviting. There is also a salon on site, so the residents can still look their best without having to go too far. The bedrooms are a bit small as most residents have to share the room with another person, but they are still comfortable and have a large window with a good view. The menu seems good and they offer a lot of different food options, so the residents actually get a choice of what they want to eat every day. All in all, I'd say Canterbury On The Lake has been an excellent place for my loved one. She really feels at home there now, and she's made many great friends. It's a comfort to know that she's being well taken care of, so we don't have to worry about her so much. Canterbury on the Lake is a fantastic facility. They have a great community of staff who truly care about their residents. They have an assortment of fun activities for the seniors to take part in, including bingo, arts and crafts, and occasional "field trips" for those able to go. The most fantastic part about this community is that it has different "steps." Seniors can enter into the senior living community, and when it becomes time, move into the assisted living community, housed in the same building. Finally, the building also houses a wonderful nursing home with a very dedicated staff for when residents must enter it. The best part is that residents are able to maintain long term relationships with the people around them, as all programs are housed in the same building, just in different wings. The exterior is also very beautiful, with a pond and fantastic landscape where residents can enjoy themselves when the weather allows. Overall, I was very happy with the quality of this community. After nearly five years of being in-home caregivers my wife and I knew it was time to place her mother into a nursing home. This was not an easy transition and we felt a sense of urgency since her Alzheimers condition was advancing. We were very impressed with curriculum of this healthcare facility and provided a tour by the Admissions Manager. We were taken by elevator to the floor where Alzheimers patients were cared for and found many in wheelchairs in the hallway. Here the patients were able to socialize with one another as part of their daily activities. They all seemed to be well taken care of and we received many smiles as we toured that floor of the nursing home. The only drawback of the facility is that there was a waiting list. Being pressed for a more immediate placement we had to look elsewhere for a nursing home location. I'm not a huge fan of Canterbury on the Lake. They had room air conditioners and only one elevator. They had warm hallways in the summer. It has not been remodeled recently. We visited Canterbury on the Lake, and that was our second choice, but there was no room available. It's an excellent community. The staff member took us on a tour of the place, told us everything they have, and was very open, and very friendly. Canterbury on the Lake was very close to where we were basically born and raised so my mom was very familiar with that location. It's just too big. If she lived there, she'd have to have an amigo because she uses a walker. She has knee and back problems. We found out there were people that work there that my brother knew, and she knew people that lived on our street. We thought my mom would want to be there because we were there for three hours, but when all was said and done, it was just too big. It was nice, but it just wasn't for her. They had all kinds of stuff going on. Across the board, that community was very nice. The staff was very nice and very knowledgeable, and there was a lot of information on the tour. Canterbury had a graduated care program in a beautiful facility with lots of things to do. I looked at two rooms; one was a one-bedroom and a den, and the other one was a two-bedroom, which was very nice but expensive. They had a small chapel. I did not like Canterbury on the Lake. It’s too formal for my parents. It’s not very relaxed looking, and they were the most expensive of all of them. There was a salon. They have a little café and a gift shop. I think they had a gym, too. Canterbury on the Lake is wonderful. I have told my husband that I also want to be there when we need to go into one. The staff is really great and extraordinarily helpful. If you ever need any help, they are there within a minute. Mom's apartment is about 800 square feet, and somebody comes in every other week to clean. The trash disposal is right there. They have buses to take the residents to places, and they have a ton of activities. They have 2 different dining areas, a rehab area, and a doctor on-call. The service goes all the way from independent living to hospice. It's just a really great community. The food is really good, and they have monthly meetings to get the residents' inputs. They serve a balanced diet; low sodium is also available. There are 3 floors for independent area, 3 floors for rehab, and 3 floors for assisted living. They don't have a memory care area; it would be great if they could add that. Canterbury on the Lake was clean, fresh, uplifting, and felt like a beautiful hotel. The staff was helpful, and there were activities. I saw the library, which had nice chairs and interesting pictures on the walls. When we first arrived, we looked for the "call button". The roommate said: "They won't come. They never come." She was right. Average response time was 30 minutes, often to be told they had to get someone else, which took another 15 minutes. If your family member needs assistance going to the bathroom, go somewhere else. My wife had a stroke, but was using a walker. When she arrived on a Friday, they would not provide a walker until she had been "approved" by someone who would not be back until Monday. She didn't last that long: she was sent back to the hospital on Sunday night because her blood pressure spiked after having to yell for help to get to the bathroom. I was very pleased to see how well the nurses and staff took care of our uncle and the rest of the residents. The facilities seemed to be very well kept, clean in common areas, and the rooms were nice. The outside grounds were very nice as well and there was beautiful lake that the residents could visit if they'd like. The staff was also very accommodating to us while we visit and allows us our time without too much interruption. The nurses also kept us abreast of anything that we should be aware of and just generally seemed to take very good care of our uncle. The facility also seemed to have quite a few activities and social events for the residents to take part in, including a visit to a major league baseball game. This really pleased my uncle, till this day he still talks about the game. Overall, I would definitely rate our experience with this Assisted Living facility as very positive. Canterbury is a retirement community unlike any other, offering three different levels of care under one roof: Independent Senior Living Apartments, Assisted Living Apartments and our Health Center, which offers short-term rehabilitation and long-term care nursing. All three levels of care have access to the Medicare certified skilled care rehab center. The Leas is designed to ensure the highest level of independence for each resident's functioning level. The Leas also offers gathering places and lounges, a restaurant-style dining room, worship opportunities in St. Luke's Chapel, outings, and a full activities schedule, including music therapy, crafts, and gardening. With 24-hour staffing, medication reminders and assistance with daily living activities, residents and their families are assured of safety, comfort, and dignity. It is truly the staff--so warm and caring--that distinguishes Canterbury from other communities. Transportation is provided for residents to go to the bank, grocery stores, retail stores and even special trips to places of interest, such as Tiger games, casinos and museums. Personal trips can be scheduled including doctors' visits, family get-togethers or even service to the airport. With the amount of activities, residents at Canterbury are never bored. Many who reside here find hobbies that they never knew they had. Some notable activities include crafts, swimming, computers, Wii sports, bingo and many more. We have exercise classes every day for various fitness levels -- something for everyone! Strength and Balance, Low-Impact Aerobics, Walking Clubs and Yoga. Canterbury prides itself on having a true home-like environment, where friends and neighbors gather. The spirit and atmosphere truly have earned Canterbury the reputation as a warm and comfortable place to live. What should caregivers and potential residents know about Canterbury on the Lake?